Tell Me a Story: Reading England 2015: Where to Next? Reading England 2015: Where to Next? I finished Shirley by Charlotte Bronte and although I will still have one foot in Yorkshire as I write a post reading wise it's time to move on. my attention. Every time I look at its cover I have the same thought - 'I bet that's a Grimshaw!' And so it turned out to be. John Atkinson Grimshaw (1836 - 1893) was a Yorkshire painter who I discovered back in 2012 when I was writing a post for The Tenant of Wildfell Hall. A connection to the Brontes which feels like a signpost showing me the way forward and a moment to remember a very happy day! On holiday for a limited time and with other people's wishes to consider there often has to be a compromise and mine was Haworth or Scarborough? I chose the latter because it was tourist season and I had visions of hordes of visitors overrunning Haworth - I don't like crowds. It was the most beautiful summer's day in Scarborough. Far below the sea glittered in the sun, the castle wall loomed on my left and the bells of St Mary's church were ringing for a wedding. Hard to believe that I'm here, sitting beside the last resting place of Anne Bronte and wishing I had brought flowers to replace the dead ones . Magical! After my family managed to drag me away it was a short stroll to look over the other side of the harbour and a stop for refreshments at The Castle by the Sea. Gorgeous views, my first taste of elderflower cordial and egg sandwiches so freshly made the filling was still warm. 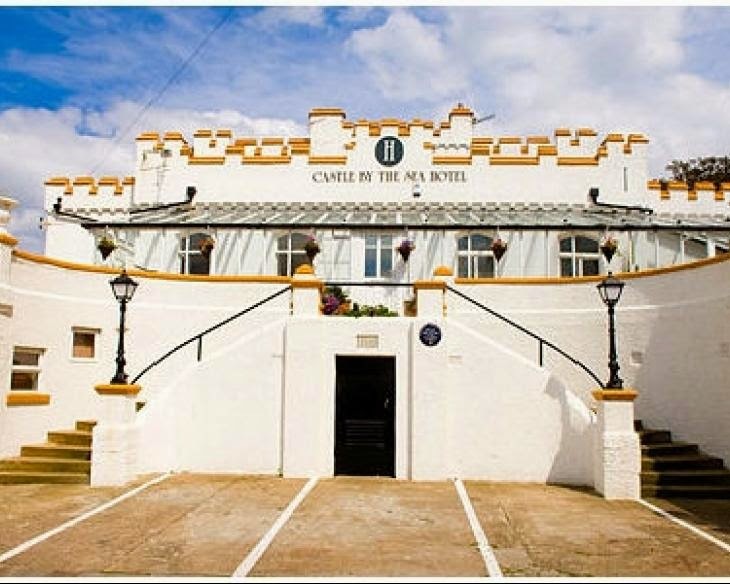 I wanted to have a look inside this unusual Victorian building and there beside the door was a plaque..
John Atkinson Grimshaw liked to spend his summers in Scarborough and had this house specially built to suit both his artistic needs and to accommodate his large family.He named it The Castle by the Sea from a Longfellow poem. 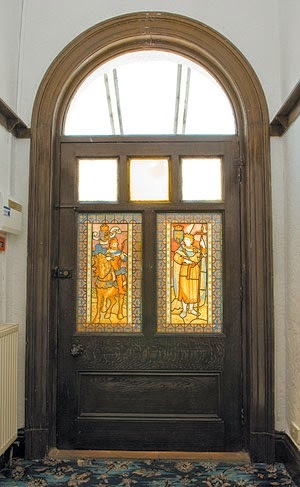 Today it is an hotel and restaurant but inside there are many prints of his paintings on the walls and the interior still retains many of its original features like this beautiful door with the stained glass panels and the elaborately carved and tiled fireplace. It was the sort of day that special memories are made of! 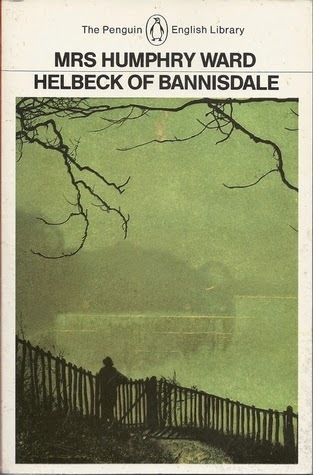 Helbeck of Bannisdale by Mrs Humphry Ward. I'm looking forward to reading an author who was apparently very popular in her time but one I had never heard of before. I love how you are doing your Reading England posts .......... so interesting! I've never heard of Helbeck. Thanks for the introduction! You're welcome. :-) I'm glad I'm not the only one who has never heard of this book or its author. I enjoyed this post today. I love the Grimshaw picture.I would love to have that on a wall. I would have felt the same about wanting fresh flowers too for the Bronte grave too. I don't like seeing dead flowers on a grave. 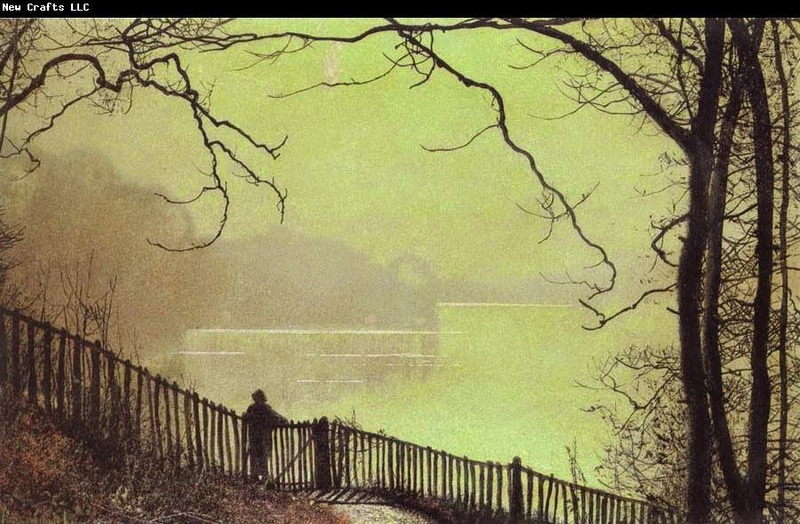 I really like Grimshaw's work most of which portrays Yorkshire scenes and lots of mists and moonlight. And when I was in Yorkshire I went to Haworth (it was in the late autumn, few tourists) but not Scarborough. I hope I might have a chance to return and visit this interesting building. Thanks for sharing your trip with us. I enjoyed the chance of reliving our visit. Would love to visit Haworth (maybe it will happen one day) and it would have to be in the off season. Love this post :) And thanks for introducing me to Helbeck - I'll look out for her, sounds very interesting - looking forward to your review! So far it's very easy reading and I'm very interested in the theme. Hope you can find a copy - I think I was very lucky to find it here. Lovely photos, but I don't think I could resist Haworth! I had visions of dozens of people all trying to enter the parsonage and I know I would have hated that - I know I made the right choice especially with the added bonus of Grimshaw's house. Every time I see mention of 'Reading England' I wonder who's going to come up with a book for my home county: Rutland. All I've ever come across is a couple of mentions in fox-hunting passages in Trollope. Perhaps I should hand the problem to someone in Rutland's excellent library service.